After trying beer for the first time in college, I was subsequently subjected to four years drinking Budweiser and other related Bud products. One of the disadvantages of going to school in St. Louis. After that, I swore never again; if I was going to drink beer, it was going to be good beer. Or at least beer with a little personality. Since then, I've sworn off bad beer (the exception being a well timed Hamms after a ultimate tournament; have to rehydrate you know...). Throughout this trip, this hasn't been much of a problem; the beers of Europe delivered, Asia surprised ( Beer Lao being the big winner) and I even had a Budweiser (the much tastier Czech beer of the same name) along the way. However over ten months, I'd had zero US beer. Obviously anything you're going to get is of the mass produced variety and despite the Chinese folks digging into to their Buds on the train, I wasn't interested. However when we arrived in Xiahe, I saw a curious thing. Buried on the shelves of the local market was a familiar sight. PBR. Pabst Blue Ribbon. Feeling a bit homesick and after some serious consideration I decided to break the streak and bought myself one on our last day out of town. We thought we could take a good picture of me, the PBR, and some Yaks or Tibetans. Surely between Xiahe and Langmusi we could make that happen. To make an increasingly long story short, we never did take the picture and I never had the chance to drink it so I carried that bad boy around until we got to the Lanzhou airport for our flight to Kunming. At this point, I was determined to have it as a pre-flight drink. Unfortunately my plans were foiled by the staff at the metal detector. I put my bag through the x-ray and they wanted to take a look. To the amazement of everyone (including his fellow guard) the one guard CONFISCATED my PBR. Never mind the fact that I had a Leatherman in my bag. Me thinks someone wanted a little break time refreshment. Feeling confused and in many ways denied, I shrug it off with some disappointment move on. Flash forward to Kunming. During my infamous trip to the Wal-Mart I'm headed to checkout and what do I see out of the corner of my eye? The LIQUOR section. Never one to pass up the opportunity to do a little window shopping, I walk over. What's the first thing to catch my attention? The elusive PBR. I quickly throw one (and a Guinness in case one takes me for a beer heathen...) into the cart and head off. My reward is shown above, en route to Hong Kong. PBR me ASAP! That picture can and will be used against you in a court of (beer snob) law. I will file it away with my picture of you wearing an OSU Beavers hat and t-shirt. Now if I can just get a picture of you holding your Daisy Red Ryder BB gun . . . I haven't been to the site in about 2 weeks so was catching up. Low and behold...PBR!!! That rocks! 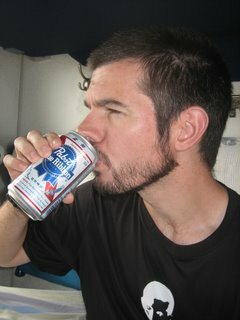 I of course will be having PBR tonight at Spring League. I'm loving Becca and yours work and insightful comments. Enjoy New Zealand. P.S. Nice Spartacus shirt. I wore my counter to that one yesterday for a run.